Brinson visits the Kentucky Army National Guard in 2010. Larry Sylvesta Brinson (born June 6, 1954) is an American college football coach and former football running back in the National Football League (NFL) for four seasons in the late 1970s and early 1980s. He played college football for the University of Florida, and thereafter, played professionally for the Dallas Cowboys and the Seattle Seahawks. Brinson was born in Opa-locka, Florida in 1954. He attended Miami Northwestern Senior High School, where he played football and also lettered in track. Brinson accepted an athletic scholarship to attend the University of Florida in Gainesville, Florida, where he played for coach Doug Dickey's Florida Gators football team from 1973 to 1976. In 1973, he became the starter at running back after Nat Moore sprained his foot and fractured his left tibia, but would lose playing time with a dislocated wrist that kept him out until the month of November. He was named the starter at right halfback as a sophomore, but suffered a hip pointer injury and was relegated to a reserve role behind Tony Green, while rushing for 418 yards. He would regain the starter position as a senior, spending time at right halfback and fullback, finishing his college career with 1,105 rushing yards on 240 carries and 9 touchdowns. He also played in four bowl games and graduated with a bachelor's degree. Brinson signed as an undrafted free agent with the Dallas Cowboys in 1977 and made the team despite fracturing a cheekbone during training camp. He was released on August 28, 1978, before being re-signed in October after Doug Dennison was injured. He was waived on September first, 1980. He played three seasons as a backup fullback and kickoff returner, including Super Bowl XII and Super Bowl XIII. Brinson was claimed off waivers by the Seattle Seahawks on September 3, 1980, but was seldom used, playing in 7 games and rushing for 57 yards on 16 carries. He was placed on the injured reserve list on August 17, 1981. After retiring from the NFL, Brinson became the running backs coach for head coach Ken Hatfield at the U.S. Air Force Academy in Colorado Springs, Colorado in 1983. Hatfield was a Florida Gators assistant coach when Brinson was a Gators running back. Hatfield's offensive scheme was run-oriented, emphasizing Brinson's area of expertise. Brinson moved with Hatfield and became the running backs coach for the Arkansas Razorbacks at the University of Arkansas in Fayetteville, Arkansas (1984–89), the Clemson Tigers at Clemson University in Clemson, South Carolina (1990–93) and the Rice Owls at Rice University in Houston, Texas (1994–2005). 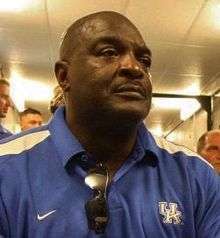 In 2007, Brinson joined the Kentucky Wildcats coaching staff at the University of Kentucky in Lexington, Kentucky, also as running backs coach, and stayed in that position through the 2010 season. Brinson has two daughters and a son. 1 2 Pro-Football-Reference.com, Players, Larry Brinson. Retrieved July 20, 2010. ↑ 2012 Florida Football Media Guide, University Athletic Association, Gainesville, Florida, pp. 95, 97, 176 (2012). Retrieved September 15, 2012. ↑ National Football League, Historical Players, Larry Brinson. Retrieved July 20, 2010. 1 2 3 4 5 Kentucky Athletics, Football, Coaching Staff, Larry Brinson Profile. Retrieved July 20, 2010. ↑ GatorZone.com, Football History, All-Time Assistant Coaches. Retrieved July 20, 2010.